In 1992, Dark Horse Comics took over the James Bond comic license and released Serpent's Tooth written by Doug Moench with art by Paul Gulacy. 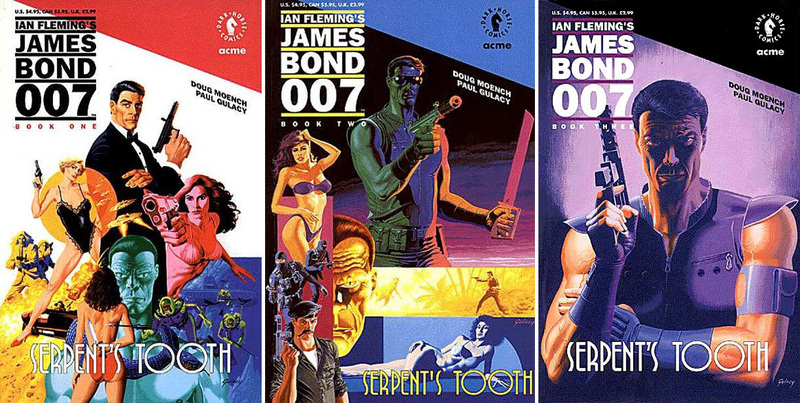 The graphic novel originally appeared in 3 issues. It was later collected into a trade paperback edition. In Serpent's Tooth, 007 battles the villainous Indigo who plans to cause massive tsunamis that will wipe out 83% of the world population (he'll rule the rest). Locations include Switzerland and Peru. 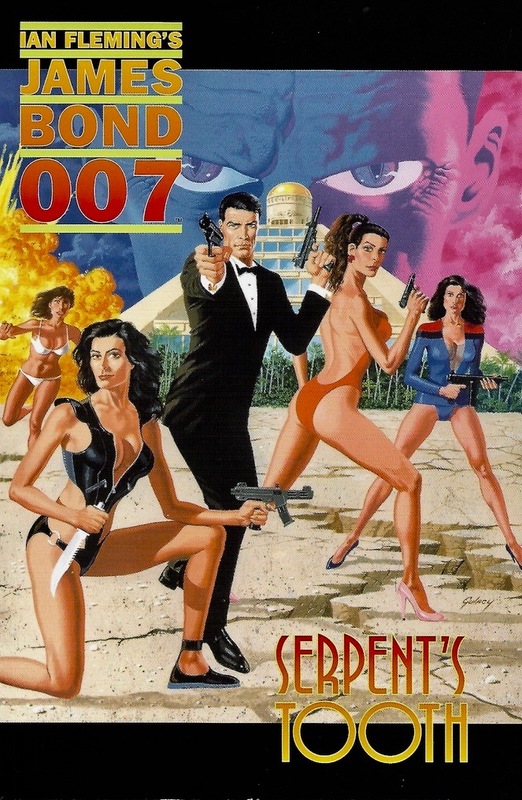 The Bond Girl is Sunny Vasquez. The henchman comes in the form of Goliath, a genetically altered 009. The story slips somewhat into the world of sci-fi. Bond even battles a genetically reborn Velociraptor! Serpent’s Tooth abounds in Bondian action, both gritty and high concert. It's very cinematic, and at the time of release, it nicely filled the void left by the "6 year gap" of the films. In fact, in many ways it feels like the large scale "fantastic" third Dalton film that we never got. 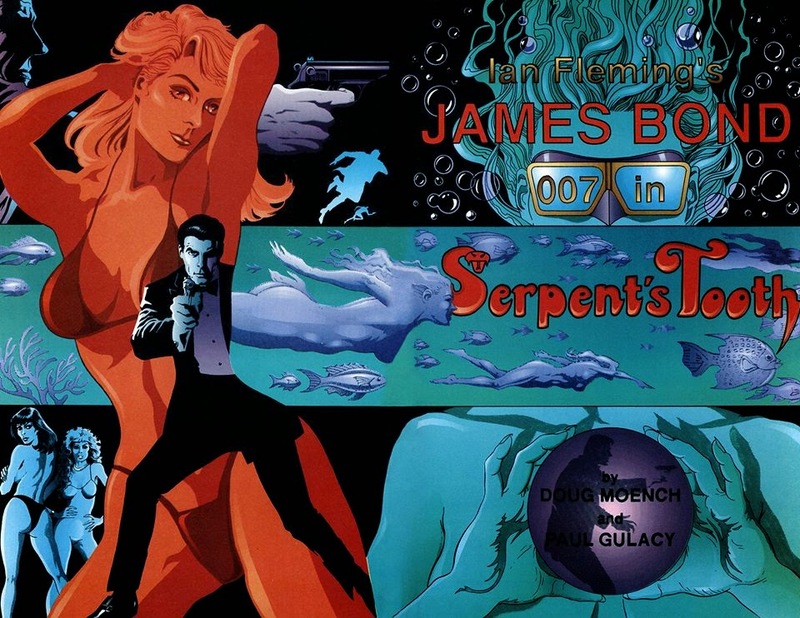 According to artist Paul Gulacy, Glidrose (now IFP) deemed Serpent’s Tooth the best non-Fleming James Bond story of them all — including all the films and continuation novels up to that point. It's definitely one of my favorite Bond graphic novels.